The wood used in an instrument is absolutely essential to the quality of sound that it produces and to its survival of environmental changes. Ukulele wood must be perfectly quarter-sawn, properly dried and stored before it is used in a Griffin Ukulele. Following are descriptions of the woods I most commonly use. Many other woods are available to the luthier . Western Red Cedar: One of myy favorite top woods is Western Red Cedar that I cut from a huge log near Bellingham Wa. fifty five years ago. The tree had to have been 1,500 years old when it was felled and that was about 100 years ago. It had been split in half and used as a floating walkway in a lumber mill log boom. The log was 60 feet long and at least five feet wide. I cut off seven feet of it, split it into four inch thick planks and have used that wood for innumerable projects over the years. Now I find it to be perfect Ukulele soundboard wood. The grain is incredibly fine, it is stiff, strong and has been drying in my shop for fifty years. The tone it imparts to my ukes in simply marvelous, mellow , warm and rich. The last tenor I made with it counts 415 growth rings across its 9 1/2 inch lower bout. That divides to 43 growth rings per inch, incredible! Most tops are perfectly clear . I have some with prominent dark stripes if that is to your liking. It is perfectly quartersawn and has prominent medullary rays and silk. It is rare cedar. Sitka Spruce: This is the same spruce used by Martin Guitars and Taylor Guitars, most of it comes from the Queen Charlotte Islands of British Columbia, perfectly cut and kiln dried by Pacific Rim Tonewoods. It is strong, resilient, the wood used to build world war I airplanes because of its flexibility and strength. Provides a bit more punch to the sound. Warms up as it is played in. I cherry pick for tight clear grain. I also have some lovely "bear claw" Sitka which makes outstanding tops. Engelmann Spruce: My personal favorite spruce because its grain is finer than Sitka, it is lighter in color than Sitka. It also seems to be warmer in tone. On the negative side, it is softer than Sitka and easier to scratch and dent. Getting hard to get, this spruce grows at higher altitudes and the trees are smaller. 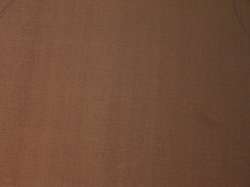 Redwood; I have recently discovered the wonderful qualities of Redwood. A friend remodeled a bathroom in his luxury home that was paneled with Redwood. I was able to cherry pick quite a bit of nice quarter sawn paneling. I have made three tenors with the Redwood soundboards and they are outstanding. Since then I have been able to acquire a small supply of master- grade redwood re-cycled from an old water tank that for 80 to 100 years sat atop a New York City apartment house. The grain is so fine it is barely perceptible. It has made a score of wonderful instruments. I am sold on Redwood. An additional note. From a customer, I received a couple of pieces of Redwood from an old Marichino cherry tank from a company in Travis City Michigan that closed in 1960. I think I have enough of it for about four tenors. These will be ukes that must be played while drinking a manhatten or a Rob Roy. The wood is noticibly stained with purplish red color. What fun is that? Seashore Juniper; This wood was a lucky discovery. Thirty-five years ago, while anchored on my sailboat, in West Sound on Orcas Island, I noticed a large old Juniper tree that had fallen to the shoreline in a rockslide. I rowed ashore and sawed off a chunk of this aromatic, tight grained hard cedar like wood. I lashed the wood to the foredeck and sailed it home. It has been stored in my shop for all these years. I recently decided to try it as a tonewood. Wow, it is terrific. Incredibly tight grained and beautiful, it produces a soft, gentle sound, kind of reminds me of the islands. This wood is a sub-species of Rocky Mountain Juniper and grows only around the shores of the Salish Sea in the Pacific Northwest. I have enough of this unique wood to make perhaps ten more tenors. I feel that I have made a discovery. Because sides and backs are less important to the sound of instruments than the top wood we are more free to use fun and exotic woods. I prefer the wonderful woods of my Pacific Northwest but am also attracted to some of the exotics from distant lands. Big Leaf Maple: What could be more exotic than fiddleback or quilted maple? I love to make ukes of this exciting, tough and stable wood that grows in the forests that surround my hometown. It is showy, lovely, ever changing as you move it in the light. Its a bit difficult to work with, but with care can be crafted into beautiful instruments. If I find tiger stripe maple that has begun to spalt I grab it. I always use spalted maple on the head plate as a decorative item, and when possible, on a back. Love the stuff. American Black Walnut: Thirty five years ago I was able to buy a huge old walnut tree that grew on Dupont Street in my hometown. I use it for necks on most of my ukes. It is lovely wood, strong and stable, and I know it is dried because it has been in my shop for all these years. I also have made many ukes with walnut backs and sides. It's a great wood and if you prefer dark ukuleles this wood is for you. Koa: This marvelous Hawaian wood is getting extremely expensive and hard to get. 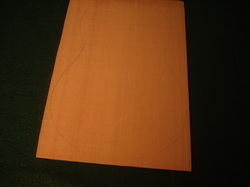 I have recently made four ukes using koa for the backs and sides. Koa may not be the very best of top woods, but the combination of a cedar or spruce top and koa back and sides seems to have a special magic. Rosewoods: I was recently able to buy a small supply of East Indian Rosewood and a tiny bit of Brazilian. I am extremely impressed with the quality of sound that the Rosewoods impart to an instrument. I am on the lookout for more. Holler if you have some to sell me. Update on East Indian Rosewood, (Dec. 2016) I have now made eight tenors with East Indian backs and sides and Redwood soundboards. I think this may be the perfect wood marriage for a tenor uke. I recently lucked into an a small stash of really fancy grained East Indian that was owned by a former hobby guitar maker. I bought it all and have been making some beautiful and unusual ukes with it. I have enough for another half dozen tenors probably. Bubinga; The stash mentioned above also included quite a bit of this beautiful African hardwood. I have made three instruments with it, and just love it matched with a Sitka Spruce top. Fretboards, Bindings: Rosettes and toe plates. Fretboards must be very hard to resist wear from the constant hard use of your fingers, but they and the bindings must also be beautiful, and decorative and provide contrasts to the body woods of your instrument. I use several woods for these purposes trying for the perfect aesthetic and practical blend. Bindings need to have toughness and be bendable as well as beautiful. Rosettes and toe plates need only beauty. Ebony: This is the classic fretboard wood. Jet black, hard as heck, beautiful in its own dark way and obviously a great contrast to most anything. I use it most frequently. Totally black ebony is getting hard to get and I find Macassar ebony an excellent alternative. It will have a little brown in it which I find rather pleasing. Honduran Rosewood: I have a local source of this lovely rosewood who imported a lot of it thirty years ago. It is hard, dense and extremely beautiful. A log will frequently have wood that varies between quite dark and quite light color and everything in between. It is always brown toned however and so I like to use it on instruments where a brownish fretboard looks better than the pure black of Ebony. Maple, rosewood, Australian Blackwood, seem to be my favorite binding materials. I will not use ivoroid or plastic materials as bindings. , Any decorative wood is fun to incorporate into the rosette. I have used Boxwood, white Koa, Liburnum, Arbutis, I even swiped a lovely piece of Olive from a woodpile on the Greek isl. of Corfu that I am going to use one of these days. Toe Plates want to match the fretboards, at least the do on my ukes.. I have currently been using Koa sapwood in rosettes. It seems to pick up light and blends very nicely with either a cedar or spruce top. Cocobolo: What a beautiful wood this is. Toxic to work with, difficult to glue because of its high oil content, but incredibly hard and incredibly beautiful. It is a Mexican and Central American rosewood. I have made just two tenors with it as back and sides, but they were remarkable. I have never heard such clear and brilliant highs. I now have a source for this fascinating wood and have a tenor under construction with marvelous beauty. It will be fun to hear the results. 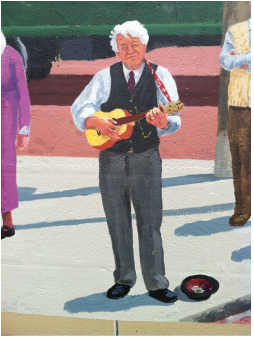 This image of yours truly is painted on a wall of a building in Fairhaven Village Green, a small pocket park in South Bellingham. Seems I am getting a reputation around town as a Ukulele guy. I hav'ent begun busking yet but I am thinking about it. If you grew up on the beaches of the San Juan Islands as I did you learned to love this wonderful wood. The native Americans used it for the planks of their longhouses and the hulls of their amazing canoes, They carved it into huge totem poles that stood for generations in their villages. They created marvelous bentwood storage boxes and so much else, It is wonderfully easy to work aromatic and beautiful. Little did I know that I would find it to be my favorite ukulele tonewood and that it would impart mellow and rich tone to my instruments. I have lots of this beautiful wood and here is a piece of it. This piece probably has 400 growth rings, you count it, I only do so when I get it glued into a ukulele, Then with a magnifying glass I carefull count the growth rings and record that number on the label. Just think, it took the tree four hundred or so years to grow 9.5 inches of wood. I would guess that the tree that provided this wood was 1,500 years old when it was felled, and the wood still lives, vibrant and strong lending its voice to your insturment. Just marvelous! I select my uke tops by tapping them to hear their tone, amazingly each piece of wood sounds different. 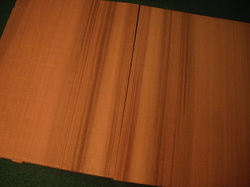 Some folks like a little striping in their uke tops and I have a limited amount of striped cedar to acommodate them. Each one of these pieces would make a top but if you want the stripes balanced I will saw them apart and join the dark stripes at the center at no additional cost. I can always used the clear outside halves in another joined top. I like to make my tops of one piece normally but it really makes no difference in strength nor sound to use a two piece top.